All of my email is sent and received using Microsoft Outlook, and there’s one feature of Outlook that I use all the time – the ability to send an email at a future date and time, rather than having it go out immediately. Why would I want to create a new email, or reply to an email, but then send it at a later time? Mainly, to avoid getting into an email-based “chat” situation. Did your antivirus program report it? This is because in some cases, people might THINK they have a virus when it’s something completely different. So when that question comes in by email, I COULD immediately reply with those questions and then just go back to what I was doing. But guess what – since I responded immediately, there is always going to be another email following up on those questions with answers and more questions. And this person knows I’m at my computer, and will naturally expect another quick response. And it continues back and forth – I call this “email chat”. Don’t get me wrong – I don’t mind communicating by email, and I certainly don’t mind when someone inquires about hiring me for my computer services. The problem arises when I’m in the middle of doing something else that requires a certain degree of concentration, and every 3 minutes I have to stop and reply to the most recent email. So why not just ignore that first email, and reply later? That’s an option, but the problem with that is that I’ll forget about it, and more emails will come in, and before long that first email is buried in the mix and I don’t notice it until a few days later. That’s not professional and I don’t want to make anyone wait that long for an answer. But there is a solution, thanks to Outlook. 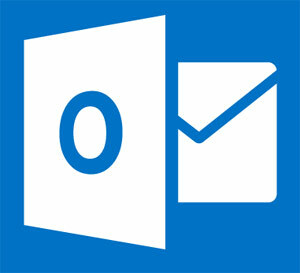 When you use Outlook for your email, you have the option to create an email now, but send it at a later time. Or even a later date. That solves the problem! I can write the email now and schedule it for later in the day. So I don’t forget to reply, but I also don’t get caught in the immediate back-and-forth email discussion right at the moment. 1. 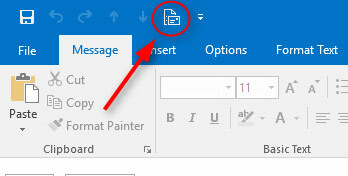 In Outlook, click to create a new email. 3. When you click that, you’ll see a new window open with lots of options. You might have fun checking out all the stuff in this window, but the one we’re concerned with now is down in the “Delivery options” section. Check the box that says “Do not deliver before” and then just choose your date and time when you want the email to be sent. Then click Close. 4. Now, that email will sit in your Outlook outbox until it’s time for it to be sent. First, if you have an email scheduled for a future date or time, and you click to close Outlook, you’ll get a little warning telling you that you still have emails in the Outbox waiting to be sent. Don’t worry about that, just tell Outlook you want to exit and send them later. Second, Outlook has to be open and running at the scheduled time in order for a scheduled email to get sent at that time. If your computer is turned off, or not connected to the internet, or Outlook is not running, it won’t get sent at that time. But it will get sent the next time Outlook is running.